Subprime Credit Cards Trend Up: Should We Worry? Are you a Jeremiah or a Cassandra on subprime credit cards? Do you know the difference between a Jeremiah and a Cassandra? No, not in the obvious sense that one's a man and the other a woman. It's perfectly possible that your great-uncle Jeremiah once dated a woman named Cassandra, but that's not the point here. A Jeremiah (after the Old Testament prophet) is someone of a pessimistic disposition who predicts a catastrophic future. A Cassandra (after a character in Greek mythology) is also someone who (accurately) predicts disasters, but is doomed not to be believed. If your great-uncle Jeremiah really dated a Cassandra, the poor bartender who served them that evening is almost certainly still in therapy. Credit card debt for the subprime: a disaster in the making? Is your blogger a Jeremiah or a Cassandra? He's been repeatedly warning about the dangers of issuing credit cards to subprime borrowers since at least Dec. 2010. He started off thinking of himself as just a grumpy pessimist making gloomy predictions, but now he's beginning to wonder if he's someone doomed not to be believed. 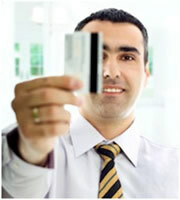 Credit card debt owed by subprime consumers shot up 41 percent between 2010 and 2011 to a new four-year high. Over the same period, credit limits on subprime credit cards increased 55 percent. Or a sensible business model? The evidence of increased lending to sub-prime consumers demonstrates banks' ongoing efforts to grow lending by providing credit opportunities to more consumers. Year-over-year results show borrowers are taking advantage of the new opportunities and seeking to diversify their financial activity, which is building momentum toward economic improvement. You don't get to be chief economist of a big player such as Equifax without being much smarter than this blogger. Which is why it seems so odd that Cutts' remarks were so calm. I'd expect her to be screaming at the top of her voice, "You're doing it again! This is what caused the last credit crunch and the great recession! STOP IT!" Although the growth in subprime cards and credit limits is very fast, the numbers involved are still a fraction of those in the period immediately before the credit crunch. When polled by FICO recently, bank risk managers said they expected today's low delinquency rates to continue, with only 32 percent expecting them to rise for credit cards. That was down seven percentage points compared to the previous quarter. Some credit card companies claim that they're deploying new profiling techniques and technologies that should help them differentiate better between those who find themselves temporarily in the subprime category as a result of a short-term crisis, and those who are genuine deadbeats. Should credit card companies worry? So does that mean there's nothing to worry about? Possibly. It depends on whether you trust risk managers and others who run credit card companies to exercise good judgment in determining their lending policies. [Credit card companies] want to grow, and you can't grow if you're only lending to super-prime and prime customers all the time. A normal strategy is to look across the risk spectrum and to lend to as many consumers as you can, and so they've started to pull back from this flight-to-quality strategy a little bit. Luxury retailers are smiling. So are the owners of high-end restaurants, sellers of upscale cars, holiday planners, financial advisers and personal coaches. For them and their customers and clients, the recession is over. The recovery is now full speed. But the rest of America isn't enjoying a recovery. It's still quite sick. The finances of many Americans remain in critical condition. You may think the Americans with the most critical financial situations are likely to be those with subprime credit scores. And you may well wonder about the wisdom of extending credit to them. If you do, welcome to the Jeremiah & Cassandra Club. 0 Responses to "Are you a Jeremiah or a Cassandra on subprime credit cards?"